There's a part of me that enjoys a good epic film, but there's another part of me that finds these grand epics somewhat "stressful." There's something about watching a movie that's so big, so grand, and so long that all the ice in your soda melts, you need an intermission so you can stretch your legs, grab a snack, and use the restroom. When I think epic film, I think of a film like Ben-Hur with all it's 212 minutes of grandness is quite a great film, but sitting down to watch is well for a select few maybe pure joy, but for the casual firm enthusiast, a bit of a chore. I can enjoy the huge musical scores, the star monologues, the larger than life sets, huge casts, and of course the emotional peaks and valleys. 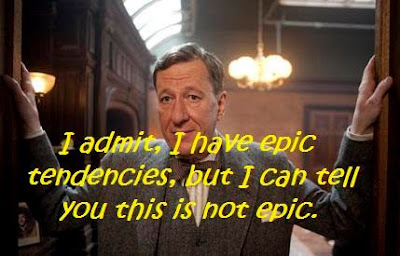 Now, I know the term epic is debatable, but it seems pretty clear that The King's Speech at 118 minutes while definitely a period film, is not an epic film of the likes of Ben-Hur, Titanic, The Lord of the Rings, Gone With the Wind, or Braveheart. And to me, that's a good thing. I plan on revisiting the concept, but I think there's something about a historic biopic that instead of trying to capture their entire life, captures something smaller in a more "feature-like" type of way. As we approach the Oscar ceremony, I think that The King's Speech is gaining more and more love, and casual movie goers are asking each other "have you seen, The King's Speech" and generally speaking positive about the film experience (unless they have tendencies to pride themselves on being contrarian to the masses). As a result this period film about a british royalty is stacking up some nice figures at the box office, and some general support. I doubt in the long run The King's Speech will have any sort of cult like fandome by anyone except high school speech theaters. But when all is said and done, so many people will see this film, because frankly, by the time it comes out on DVD no one will feel like they need to block off an entire Saturday to fit the film into their viewing schedule. interesting perspective. It was a shortish film, and it was very focussed, but I wouldn't have considered it an epic. Just a fine picture.